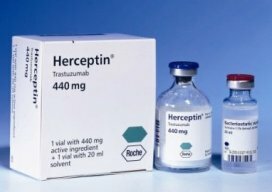 Some women with small breast tumors may have a greater risk of the cancer recurring after treatment than has been believed, and might benefit from taking the drug Herceptin, a new study suggests. Treatments like chemotherapy or Herceptin are not usually recommended for women whose tumors are smaller than 1 centimeter — just under half an inch — and have not spread beyond the breast. However, Texas researchers who looked at records on 1,315 such patients found that the 10 percent who had high levels of a protein called HER-2 had three times the risk of suffering a recurrence than did women with less HER-2. Only 77 percent of those with high HER-2 levels were alive and cancer-free five years after treatment versus 94 percent of the others. Women in the study had been treated at the University of Texas M.D. Anderson Cancer Center in Houston or at two European hospitals in the 1990s. HER-2 has long been known to predict aggressiveness of tumors. But it has been considered less important than other factors like the size of a tumor or whether it is being helped to grow by estrogen levels in body. The new findings may lead doctors to rethink HER-2’s importance and whether to more widely recommend Herceptin, which helps block the protein, said the study’s leader, Dr. Ana Gonzalez-Angulo of M.D. Anderson.